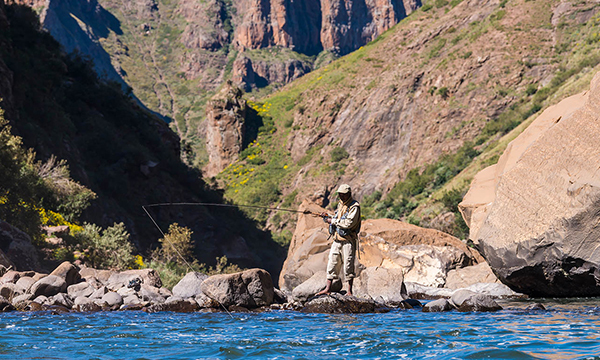 Semonkong Lodge is proud to offer fly fisherman a pristine piece of river with amazing fishing opportunities. The Maletsunyane River on whose banks Semonkong lodge nestles, presents unique fishing opportunities. The fishing is divided by the mighty Maletsunyane falls which forms a formidable natural barrier to fish movement and creates two distinctly different fishing zones in the river. The river was stocked with Trout in the mid 1950’s, with the area above the falls of both Brown and Rainbows. But as so often happens one species prevailed above the falls and today this stretch is exclusively Browns only. With around 60 years of natural selection strengthening their genes these browns have adapted well to their river and prospered. They obviously found the river to their liking and with the ample water flow, abundant food supply and minimal fishing pressure, have developed into a population that rivals those in the best trophy rivers in famous destinations such as New Zealand, Patagonia, Alaska and around the globe. There is unlikely to be another location in Africa where there is such a realistic possibility of catching a 10 pound wild Brown trout in a natural river with the average size of catches in this part of the river quite impressive. This piece of river is easily accessible, with the lodge situated roughly midway between the falls and the road bridge weir, above which trout are not found and the Maluti Redfin Minnow (Pseudobarbus Quathlambae) proliferates. The fish in this stretch readily take a variety of nymphs and streamers and in the late afternoon and early morning, when weather conditions permit, there is strong rising in most of the pools which provides spectacular opportunities on dry fly. Downstream, the stretch of river between the falls and the confluence with the Mighty Senqu is truly magnificent. Here the Browns are still found, but they share the river with Rainbow Trout and Yellowfish, with the challenge of achieving a ‘grand slam’ by catching all three of these species. This prospect is made even more exciting because all of these species are found in this stretch of river in trophy proportions. ONLY FLY-FISHING IS PERMITTED and a policy of releasing all fish must be adhered to. The trout season is closed from the month of May through to the end of August. Fishing equipment is available for hire. There is a fly-fishing fee per person per day which is a Maletsunyane River Conservation Fund and Guiding fee where all fishermen are provided with a local fishing guide. No fishing is allowed during the period of 1st May through to 31st August of any year. Children under the age of 12 years are FREE of charge. All the funds collected will be spent on cleaning the river. Please support employment projects by hiring a local Fishing Guide, who will show you where the good fishing is and who will communicate with the Community along the river. 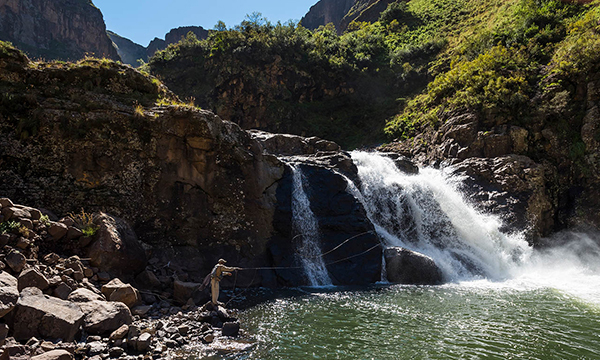 Base yourself at Semonkong Lodge and fish the Maletsunyane River above the waterfall for Brown Trout, with a local Fishing Guide who will take you to where the fish are. Take a guide and hike (or abseil) to the bottom of the Maletsunyane waterfall and fish for Rainbow Trout. There is a strenuous hike out of the gorge but really worth while. 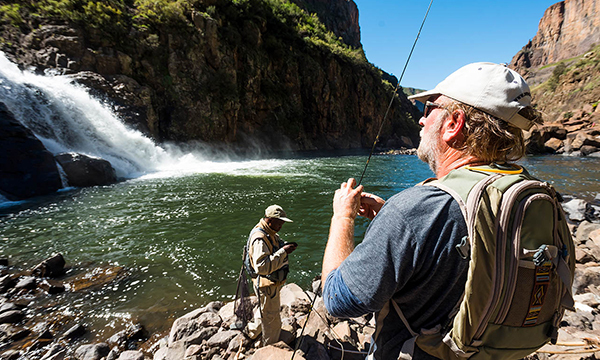 The Maletsunyane has carved a spectacular gorge downstream of the falls and this fantastic piece of river provides some unforgettable fishing, though access is not as simple as above the falls. Semonkong lodge arranges a 4, 5 or 6 day hosted trek into the gorge, where equipment is carried by pack horses and donkeys. This trip is strenuous and unfortunately limited to those who are physically fit. The trip departs from the lodge with fishermen travelling by 4×4 vehicle to a point above the gorge where we rendezvous with the pack horses. The equipment is loaded and the horses are lead down the descent by guides.Fishermen and guests carry only their fishing packs/daypacks. At the bottom of this climb, surrounded by spectacular cliff faces, the first night’s camp is set up. After everyone has unpacked and a hearty lunch, the rest of the day is spent fishing. All meals are prepared by your guides, leaving you to concentrate on the fishing. After breakfast in the morning, the fishermen depart to fish the river with the fishing guides while the camp is packed up and loaded onto the horses for the journey to the next night’s camp. Lunch is served en route on the river and that afternoon the fishermen arrive at the next night’s camp. The gorge changes around every bend with the sides becoming steeper and more rugged and imposing as one proceeds upstream. Depending on weather and river conditions it is possible to fish right up to the base of the Maletsunyane falls; this stretch is truly wild with fabulous scenery and bird life and has been fished by very few people. The trip will leave you spellbound! For full itineraries – please contact us. Rods in the 3-5 wt range are recommended with floating and intermediate lines. Successful flies include Zak, PTN, Copper John, GRHE & Flashback nymphs in dark colours, size 12-16, Black, brown & green weighted Woolly buggers & Papa Roach in size 10-14, RAB, Parachute Adams & Elk Hair Caddis size 14-18. Suitable, large capacity fishing pack or vest. Rods and flies much the same as above but do be sure to bring some black mayfly nymphs in size 18 and even 20 as turning over rocks in the gorge reveals some really small nymphs and these small sizes can be very successful. Footwear for the gorge needs to be suitable for very rough terrain and quality hiking or wading boots are essential. Please contact us before your trip for a comprehensive list and advice if required. It is important to note that the trek into the gorge is extreme and physically demanding, although this trip has been done by many, including a 70 year old fisherman he was in peak physical shape, a pre-trip fitness program is recommended.